Just wanted to let you know that these no bake gluten free paleo lemon bars are sponsored by my friends at Abby’s Better! 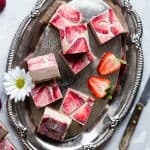 This vegan lemon bar recipe has the flavor of sweet strawberries and creamy cashews with zippy lemon! A healthy, paleo friendly, dairy free treat for the summer! NEW lemon bar recipe WHO DIS. You know what? That is the first time in my entire life that I have typed the words “Who dis.” I am feeling VRY VRY young, hip and trendy at the moment. THE BEST LUSCIOUS LEMON BAR RECIPE YET. 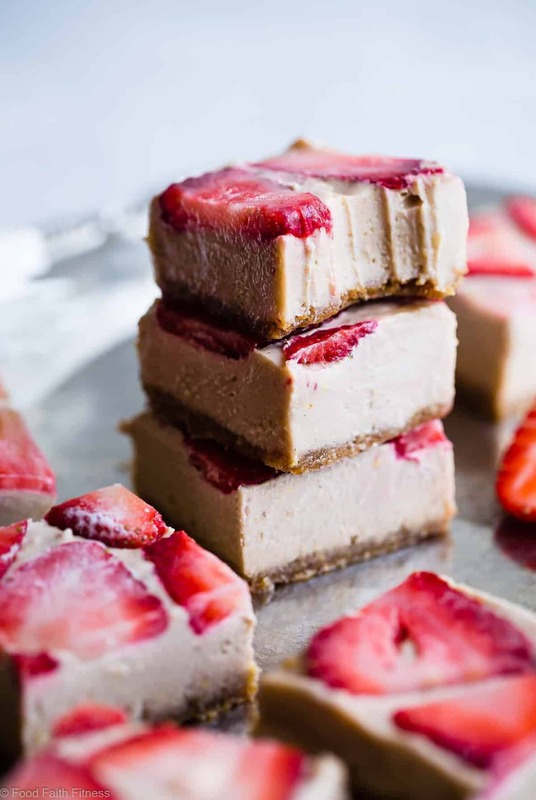 We’re talking a perfectly nutty and sticky sweet base of dates and toasty cashews that is the foundation of the most EPICALLY creamy-dreamy NO BAKE lemon layer that’s wrapping its bright and tangy self around swirls of STRAWBERRY CASHEW GOODNESS. Could there really be anything for magical and perfect and delicious to put into your mouth all summer long? I’m going with a HARD NO on that one. It’s large. It’s in CHARGE and it’s piled HIGH with Abby’s Better Nut Butter! Have you tried these velvety-smoooooth butters yet? Abby makes 5 SUPER original flavors (like this strawberry cashew or the ADDICTING date pecan!) and they’re all made with simple, clean, real-food ingredients that are gluten free, peanut free and have paleo and vegan options! Music to my nut butter lovin’ SOUL. Since you totally dug the whipped homemade almond butter and cinnamon roll homemade cashew butter, I can guess that you’re JUST as into creatively-delicious-nutritious-nutty spreads as I am. So this creamy-dreamy and fruity-fresh strawberry cashew butter? It’s gonna be your SPIRIT BUTTER. <– Make sure you enter the giveaway at the end of the post! 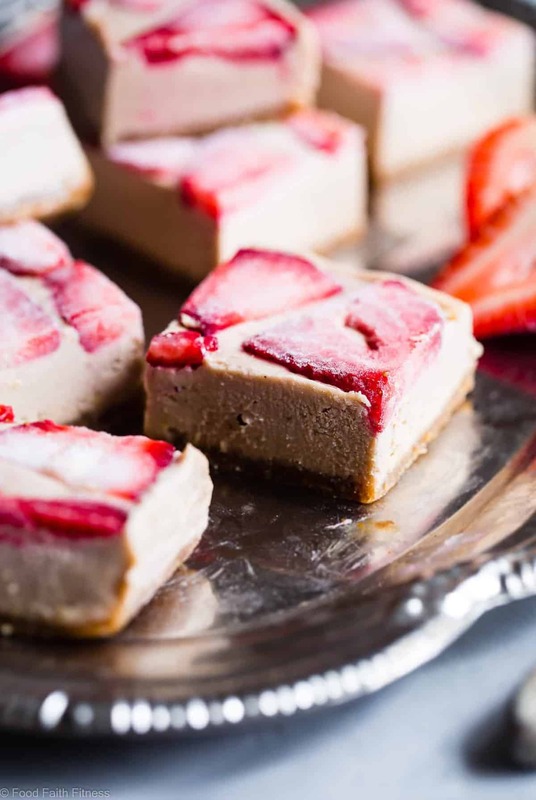 If you thought you were a “lemon person” before this post, just wait until your try it’s zippy-zingy flavor with sweet strawberries and rich, CREAMY cashew butter in these no bake gluten free paleo lemon bars. They are little squares of heaven for the do-not-want-to-turn-the-oven-on-summer-life that I live. And, considering our internet BFF status? I know YOU DO TOO. Do you need to use fresh lemon juice for lemon bars? If you want to answer the question of how to make paleo lemon bars the BEST, then YES, yes and more YES. Resist the urge to make these dairy free lemon bars even EASIER than they already are and use store bought lemon juice. It 110% does not give the same flavor. It’s stronger and sourer and just ALL AROUND no good. Fresh lemon juice and zest is KEY to giving these bites of bliss the perfect amount of luscious lemon. 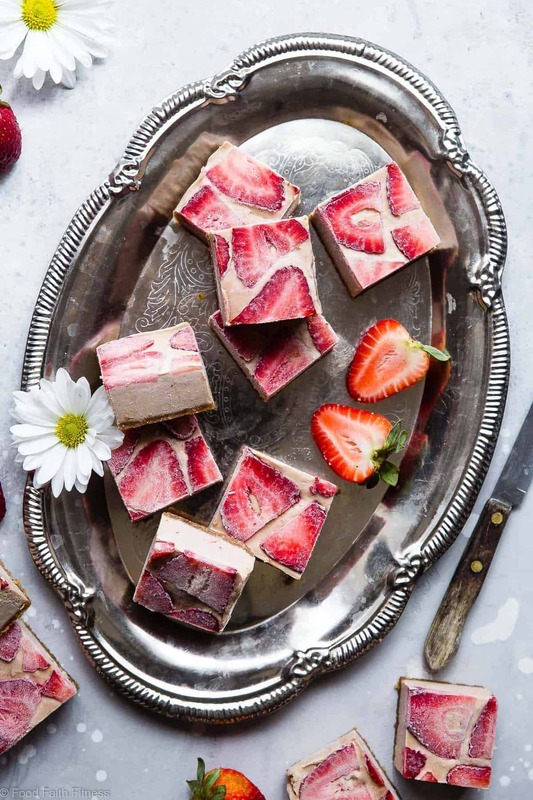 Add a few fresh, THINLY sliced strawberries on top for that extra PUNCH of flavor and you’ve got yourself a perfectly balanced paleo lemon dessert with hints of tang, notes of sweet and creamy-cashew goodness to tie it all up in lemon LOVIN. I told you. I wasn’t wrong that these are the BEST version of lemon bars that they could be. Now you have to be the best version of summer-food-eating-YOU that you could be and FACEPLANT into a stack of ‘em. 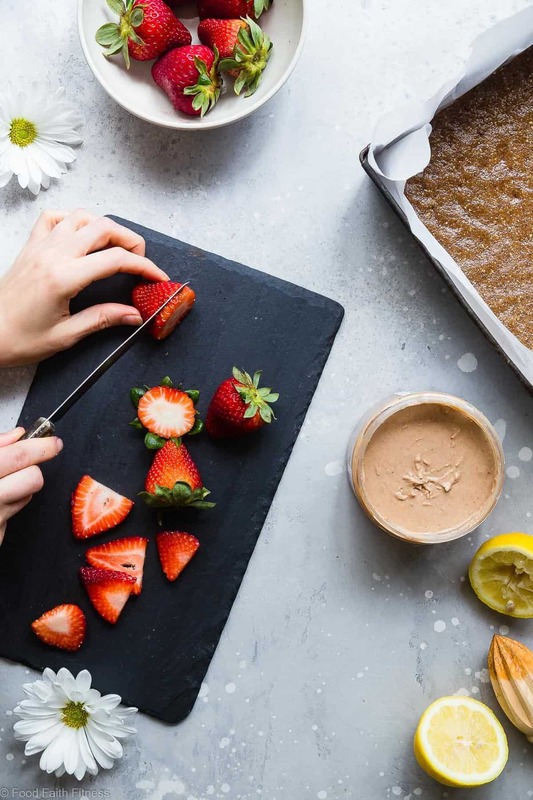 These no bake gluten free paleo lemon bars have the flavor of sweet strawberries and creamy cashews with zippy lemon! A healthy, vegan friendly, dairy free treat for the summer! Press the crust firmly into the bottom of the prepared pan. You need to press it very thin, so really use your muscle and work it in there. Place into the freezer while you make the topping. Drain the cashews and place them into a high-powered blender. Add all the remaining ingredients, except the strawberries, and blend until smooth and creamy, stopping to scrape down the sides as necessary. Pour over the crust and smooth out evenly. 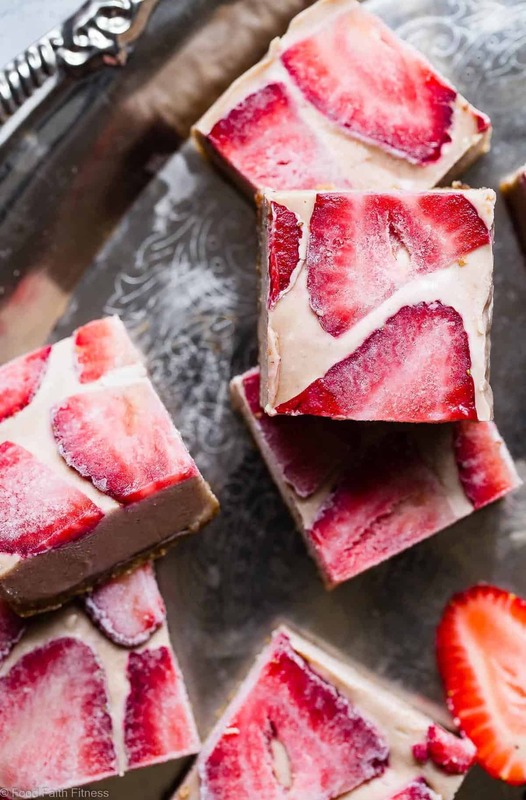 Top with the sliced strawberries and freeze until firm, about 4-6 hours. 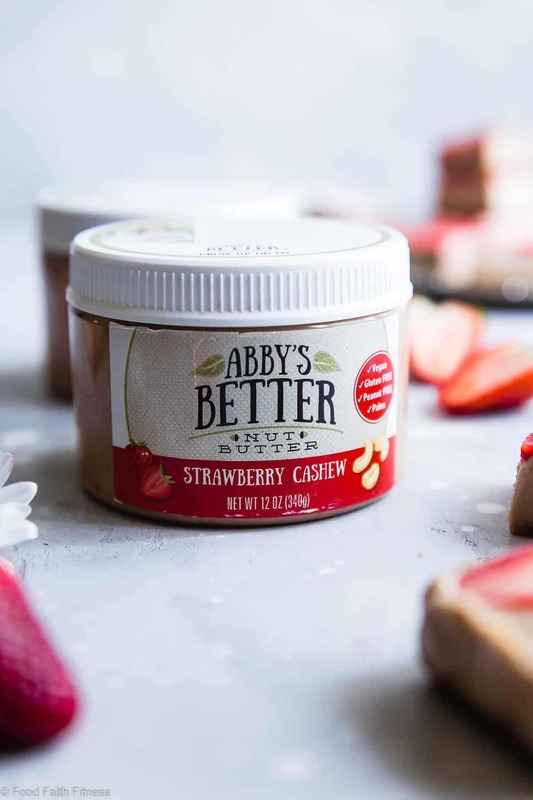 THIS POST IS SPONSORED BY MY FRIENDS AT ABBY’S BETTER. THANK YOU FOR ALLOWING ME TO CONTINUE CREATING GREAT CONTENT FOR YOU BY SUPPORTING PARTNERSHIPS WITH SUPER-FAB BRANDS THAT FOOD FAITH FITNESS LOVES TO WORK WITH! AS ALWAYS, OPINIONS REMAIN 100% MY OWN! Too funny; I just posted a recipe for strawberry PB&J butter yesterday on my blog! These bars look so creamy and refreshing for summer…and I absolutely LOVE that they can be made ahead of time to keep in the freezer for guests too! Right! It’s so good to have a dessert on hand! LOVE that we are strawberry twins!! These sound so perfect for summer! I always forget how enjoyable a fruity dessert can be when the temps start getting so warm! Right?! So tasty and refreshing! LOVing this better for you nutter butter and these are the BEST! You would LOVE these Naomi! Taylor!!! You never cease to amaze me!! Way to make another perfect treat for me to face plant into!! The best flavor combo! Looks amazing! These look amazing! I also agree that storebought lemon juice is just no bueno. I have a few lemons left on my tree and some fresh strawberries in the fridge, guess what I”m making tonight! I am SO jealous you have a lemon tree!!! But I hope you love these! Hi Taylor, this recipe looks fantastic! Will give this one a try. I need a new snack to put into rotation, and these sound like they’ll fit the bill perfectly. Nice photos too btw….the staging, textures, and colors really work well together. Keep up the good work! Looking forward to what you come up with next! Just Wow! They look awesomely delicious! So excited to try this. I’m sure that my kids will also enjoy these yummy bars. I love strawberries. I also love lemon bars. This recipe is a sure winner! Thanks for sharing! I hope you love it Alen! I really can’t bake. Seeing no-bake recipes like this make my heart jump for joy. I love desserts but the process of baking one just isn’t for me. I will definitely try this recipe soon. Wow! I can’t wait to eat some of them! The strawberries give it a twist. Yummy! Hope you love them Stella! Yum! this looks stunning. I am definitely gonna make this nutritious food this weekends. Surely my family will love it.